Stems: Erect or ascending, 1 to several, branched, 4-sided, grooved, whitish-pubescent above, purplish below. Leaves: Opposite, simple, stalked, triangular to ovate, 1 to 4 inches long, .75 to 2.75 inches wide, green and lightly pubescent above, gray-hairy to nearly woolly below; margins toothed; tips pointed or blunt. Inflorescences: Spike-like, .5 to 3.5 inches long, .5 to 1.5 inch wide, many-flowered. Flowers: Calyces 2-lipped, lobes narrowly triangular, tips tapering to points, hairy; corollas 2-lipped, up to .5 inch long, white with purple or reddish spots, outside pubescent; lower lip 3-lobed, bearded at base inside; stamens 4, 2 long, 2 short. Fruits: Nutlets, egg-shaped, smooth, slightly flattened, reddish brown, 1-seeded. Habitat: Sunny or shaded disturbed sites, old farmsteads, waste areas, and thickets. Forage Value: Deer sometimes consume catnip. Uses: Early Europeans made a medicinal tea from catnip and used it to treat convulsions, nervousness, and coughs. Native Americans used it to treat colds, coughs, headaches, fevers, and infant colic. Comments: An oily substance found in the leaves is irresistible to cats. 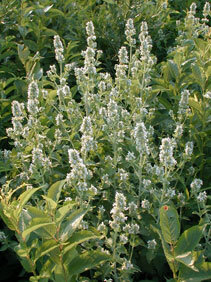 Catnip was introduced into North America for its purported medicinal qualities. It is now naturalized.